In this section we have Renthal grips, Domino Grips, Renthal clip ons and clip on tubes for your road racer. We supply K & N Air filters for your track bike, race bike or road bike to help them breath easy and give maximum power. K & N air filters are known as the highest quality air filter, that give power gains and longevity. We supply 520 pitch race Renthal. DID & Tsubaki chains and Renthal sprockets for road racing. Renthal sprockets are aluminium alloy and are 66% lighter than steel. High quality lightweight Renthal chain and sprockets help reduce rotational mass and help improve performance of your road racing bike. The most powerful part of your motorcycle is not the engine - it's the brakes. HEL Brake lines offer superb increase in braking efficiency. We supply single HEL brake lines in a variety of colours. SBS Brake pads are the choice of champions. SBS are used by Ten Kate Honda, Kawasaki Factory racing, Althea Racing Ducati, and Yamaha Motor Italia. SBS Brake pads are high in quality and performance. We supply SBS dual carbon brake pads or SBS race sintered brake pads for road racing and SBS sintered and SBS race sintered brake pads for motocross and enduro applications. High quality spark plugs from NGK, we supply copper core and Iridium spark plugs for Kawasaki, KTM, Suzuki, Honda and Yamaha. NGK has sparked countless victories. Whether its Road Racing, Moto-X or Trials, NGK has the ideal plug. Selection of motorcycle oil filters for most common Suzuki, Yamaha, Honda, Kawasaki and KTM bikes. These are HIFLO FILTRO Oil filters, which are equal to or better than original equipment. Look here for any current discounts and deals available.Please check back regularly. The section for all you paddock and workshop needs. For road racers, this includes Biketek Digital Tyre warmers, pressure guages, lock wire kits, earplugs and stopwatches. For you motocrosser FRO pitchairs, T bar sets, motocross stands and FRO exhaust bungs. SBS Dual carbon pads are the next step up from the SBS race sinter. The pad material lines the disc with carbon. This then requires heat to give maximum performance. The SBS dual carbon pads offer outstanding performance with no brake fade for an excellent price. The dual carbons are becoming the choice of club racer's and fast track day riders. Renthal's hard anodised rear chainwheels are specifically designed for road and road racing applications. They are CNC machined from the same 7075 T6 material as our offroad chainwheels, yet feature the increased longevity from the hard anodizing process. Hard anodising is an integral surface coating which significantly increases the hardness and wear resistance of the chainwheel surface. SBS Race sinter pads are the choice of many track day rider,as well as club racers. The SBS race sinter pad need no heat to work. Therefore the SBS RS pads are ideal for track days, road racing and road riding. The race sinters are ideal if you are needing to upgrade your braking performance without breaking the bank. Tank grip. Essential in reducing rider fatigue and keeping the pressure off your arms under braking, EAZI-GRP is used by many BSB teams. Eazi-Grip™ riders had record breaking success at the 2017 IOM TT with 6 race wins, 14 podiums and over 30 top ten finishes in 8 races. Supported riders took the top step of the podium in the PokerStars Senior TT, RST Superbike TT, RL360 Quantum Superstock TT, Monster Energy Supersport TT and in both Race 1 & 2 of the Sure Sidecar TT. The same products we supply to leading teams around the racing world are available for purchase to everyone. 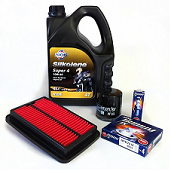 Complete service Kits containing Hi Flo Air Filter, Oil Filter, NGK Plugs, Silkolene oil. You cannot talk about Brembo without mentioning racing. Even though many production bikes are fitted as standard equipment with Brembo products, all of them start from the test bed that is racing. From Formula 1 to Moto GP and Superbike, in every racing class Brembo has succeeded in its goal – to win. They are without doubt the worlds most successful name in motorcycle brakes. They have won almost every race series in the world worth winning and in Moto GP, the toughest motorcycle series in the world, to date, no other manufacturer has won a single race! Domino are Europe's leading manufacturer of throttle controls, electric switches and handlebars. Thier expertise comes from more than 50 years experience of this activity along with the strict application of quality contol systems. The Domino name is active in the modern racing world of Grand Prix and World Superbikes. The Domino name is your guarantee of solidity and reliability from these products. Domino manufacture some of the highest quality motorcycle handlebar and control products available today, and are extensively used as OEM products by the bike producers. Domino have been making top quality motorcycle switches, grips, handle bars and throttle controls for over 50 years, and their quick action throttles are the best you can buy, they are extensively used in every level of racing. Standard engine covers are nice and light weight but break very easily if you are unlucky enough to fall off. Expensive engine damage is often the result. Fit yourself some heavy-duty NRC aluminium engine covers and if the worst should happen and you do fall off, you will save yourself a fortune. For track day and race use they are essential equipment. Niagara Race Crafters or NRC is the worlds largest producer of heavy-duty superbike engine covers, with more than thirty years experience in engine cover design and production. They have committed hundreds of thousands of dollars in design, investment moulds, tooling and state of the art CNC equipment to produce the finest heavy duty engine covers possible! They are produced to ISO 9002 quality control standards and are finished in a natural silver grey alloy with the NRC logo cast into the cover. They are very different from the cheap plastic bolt on covers which are available, which offer very little additional protection to the OE cover. NRC believe in making a high quality durable product and we know of some riders who have crashed up to 20 times on NRC covers. We therefore remain confident of their overall economy and design benefits. A selection of aftermarket switchgear to tidy up your bars, essential if fitting aftermarket Quick Action Throttles or Master Cylinders. GBRacing - protective secondary engine covers Approved by the FIM, MCRCB and by the governing bodies of several domestic race championships overseas. 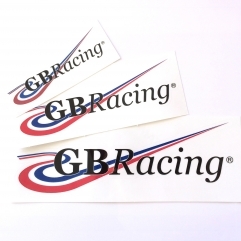 GBRacing covers are used at the highest level worldwide including British Superbikes, World Superbikes and Moto2.